Blog : How to package more product, in more formats, with less space. 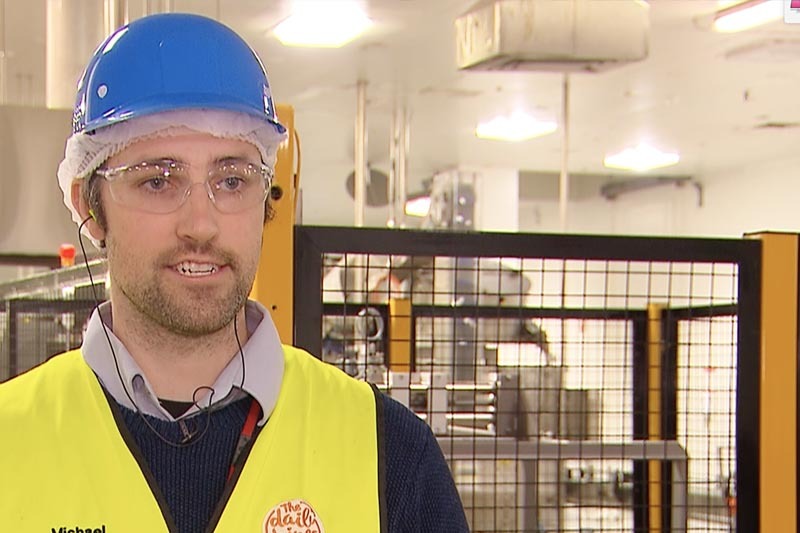 Australian manufacturers are under pressure to produce a wider range of product in smaller batches and a variety of different packaging formats—with less floor space than ever before. Foodmach offers a full range of latest-technology solutions. A filling machine that can handle both bottles and cans is a dream come true for Australia beverage producers. Vipoll’s ‘ALL IN ONE’ multifunctional system can accommodate both carbonated and still beverages, either hot or cold filling, and fills bottles and cans in multiple formats. Its sophisticated process design saves time during filling and format changeovers. The ALL IN ONE rinses, fills and caps products in the smallest production spaces. Changeovers for different products and container formats are made within minutes. This is made possible by the ALL IN ONE’s multifunctional elements: the rinser is equipped with universal grippers; the filler uses an electro-pneumatic filling valve and a single capping turret is able to accommodate different closure types. It is designed with a sequence of functions that are so seamless, only the smallest amount of oxygen enters the product during the filling process. Speed is dependent on the product and packaging, with Vipoll offering ALL IN ONE fillers at up to 24,000 bottles or cans per hour. 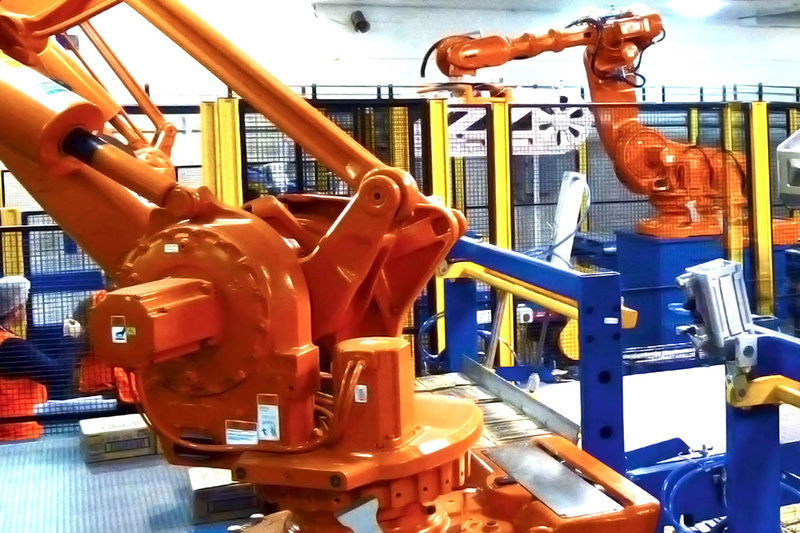 Robotic automation improves productivity, product quality and safety. A Foodmach robot depalletiser replaces manual processes for pallet unloading without interruptions for breaks, shift change, or meals. It can operate 24 hours a day, 7 days a week, in a wide variety of hazardous conditions; in compact, flexible floor layout options. 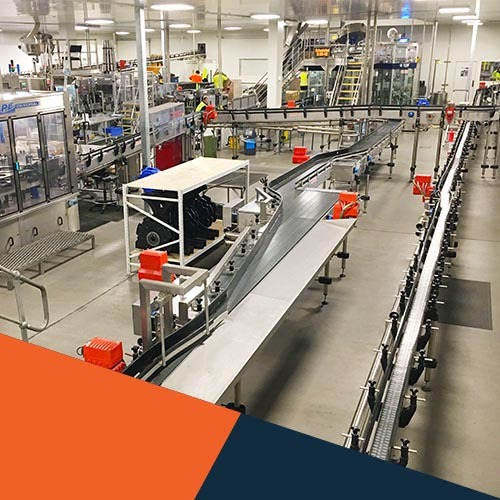 Foodmach Bag Depalletising Systems use an advanced in-house developed vision system, featuring cutting-edge vision technologies to ensure non-uniform bagged products are handled accurately and consistently. The Foodmach Depalletiser Range can be upgraded over time as needs change and enhanced with pallet conveyors and /or stackers, scale weighing systems and product tracking. Foodmach custom designs and manufactures depalletisers and palletisers for beverage producers. Equipment is fully integrated with existing machinery and the entire line can be digitised to its full potential, ready for Industry 4.0 levels of integration with the industry’s most efficient line management control systems. All systems are specifically designed for the user, with simple, intuitive controls, fast changeovers and flexible machine layout options. 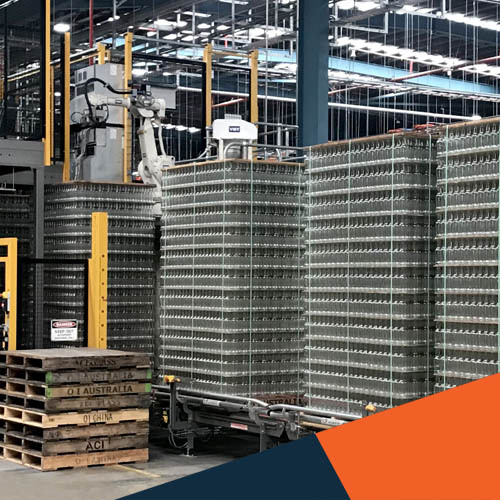 With bottlers increasingly sourcing bottles from around the globe, Foodmach depalletisers can be configured to handle a wide range of pallet sizes and related dunnage including trays, slip sheets and top frames all automatically and in many cases changes overs can be fully automated. 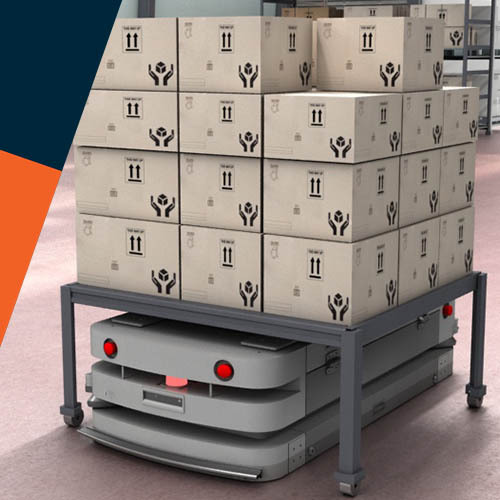 Robots are increasingly being deployed in palletising applications. Mechanical systems are a little cheaper, but less flexible and require more maintenance. For speed and flexibility, robots are recommended. Most importantly, gentler (and quieter) glass handling, engineered to handle any challenge. A production line is only as fast as its conveyors. 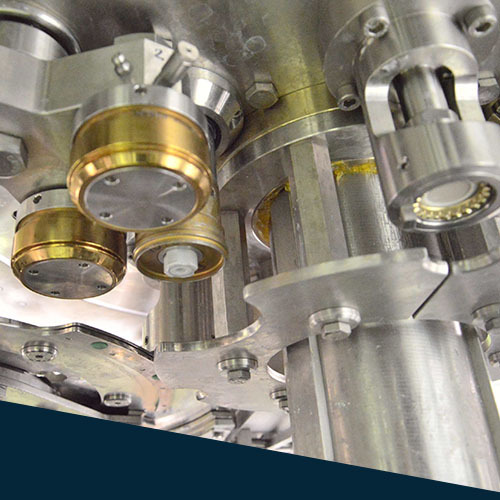 Poorly-designed conveying systems have a significant impact on operating speeds and packaging quality, so it’s critical to obtain a customised solution from an experienced team of specialists. Foodmach conveying is guaranteed to keep line speeds exactly where you want them. If you are handling glass, you need to not only see—but also hear—the difference a Foodmach conveying system makes to a bottling line. 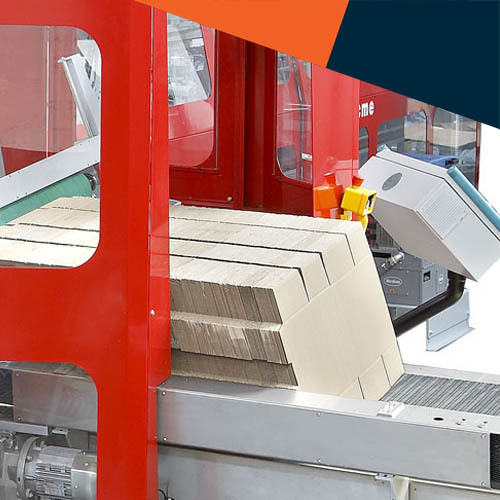 Automating your case packing operation should be done with the objective of minimising changeover times. Foodmach provides wraparound, RSC and shelf ready case packing at up to 80 cases/minute and shrink wrappers at up to 150 cycles per minute, from an in-house range and quality OEMs. We can help you find the right fit for your product, budget, desired speeds and level of in-house technical expertise. Foodmach Pick & Place palletisers use robots to pick up single cases, or a number of cases aligned the same way, to place them in the correct location on a layer. This solution has the advantage of occupying a small footprint and also has the flexibility to easily change layer patterns from one product to the next, particularly if a simple layer pattern program such as Robowizard® is used. The best analogy for how Robowizard® works is that it is like playing Tetris with robots and cartons. 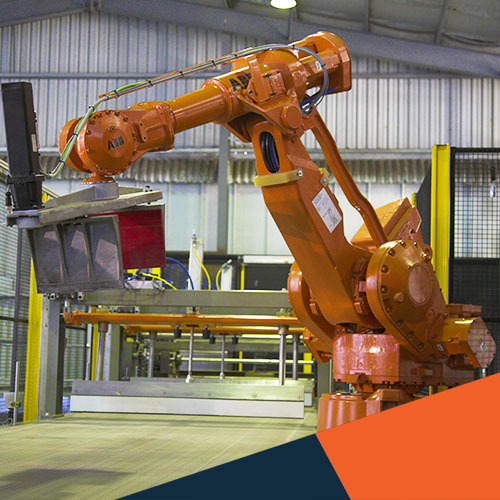 Proprietary robotic pattern forming software, Robowizard®, is provided as a drag and drop interface which enables size changeovers in minutes, not days – with no PLC technician required. It is simple to use, with unbelievable flexibility, accuracy, and reliability. 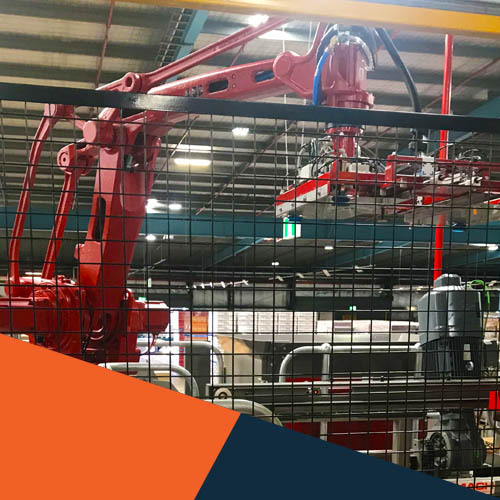 Where line speeds are low a single robot can service two or more lines, greatly reducing the cost and floor space required versus traditional palletising systems. 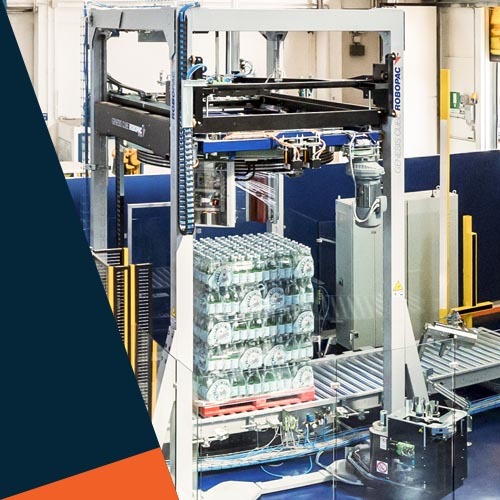 Foodmach has worked closely with some of the world’s leading beverage companies to develop and manufacture the award-winning Robomatrix®, the world’s fastest and most flexible palletising solution. A fast beverage line requires the fastest, most accurate inspection available. Foodmach team members with international expertise in inspection systems will take the time to understand your particular needs. They’ll take you through the multiple inspection possibilities and guide you to the right solution for your business. Foodmach/Markem-Imaje coding, labelling and traceability solutions are designed to support overall equipment efficiency and integrate seamlessly with your packaging line control automation. They’ll reduce coding errors and can provide anti-counterfeit measures. The equipment is simple to operate and maintain, with a low total cost of ownership. A correctly-specified stretch wrapper can easily keep up with overall production without creating a backlog of unwrapped pallets, will reduce film usage and reduce damaged product in transit. Foodmach partners with global leader in stretch wrapping, Robopac, to provide a variety of styles able to handle up to 130 pallets per hour. Foodmach also provides fully integrated systems including pallet tracking and labelling. Automated vehicles now offer a quick return on investment, machine learning, cloud-based analytics and handle loads in all shapes and sizes: pallets, racks, totes and trolleys. Foodmach offers traditional laser-guided, fork-style and trolley-style vehicles and the latest autonomous mobile robots (AMRs) for multiple applications. Our AMRs offer infrastructure-free, natural navigation and are safe and flexible for collaborative operation. Foodmach uses its unique in-house integration skills to deliver practical, applied Industry 4.0. This means working with customers to digitise production lines to the level that their budget will accommodate and internal business strategy requires. Extensive controls expertise enables upgrades to legacy equipment and implementation of line management execution systems across old and new machines. Foodmach regularly works with its clients to integrate the customer's preferred equipment. 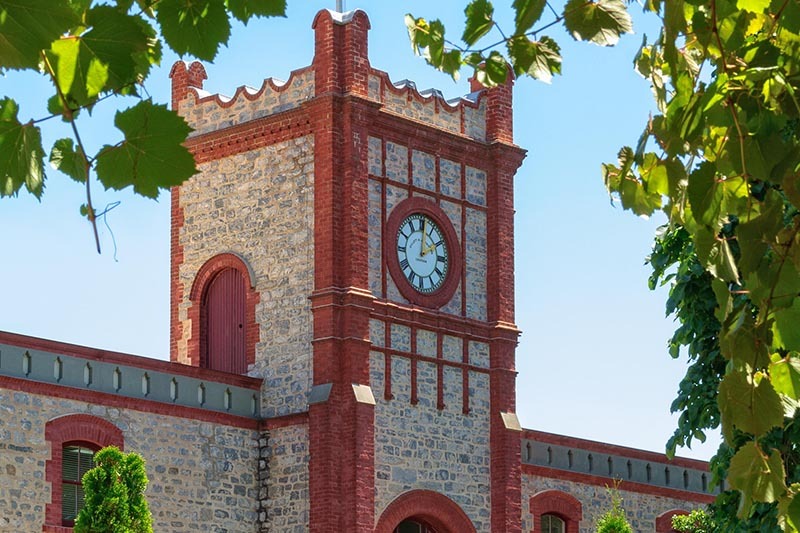 Foodmach coordinates with suppliers and takes overall responsibility for delivering the turnkey system. To make the production process even faster, Foodmach provides on-the-ground support, nationwide. 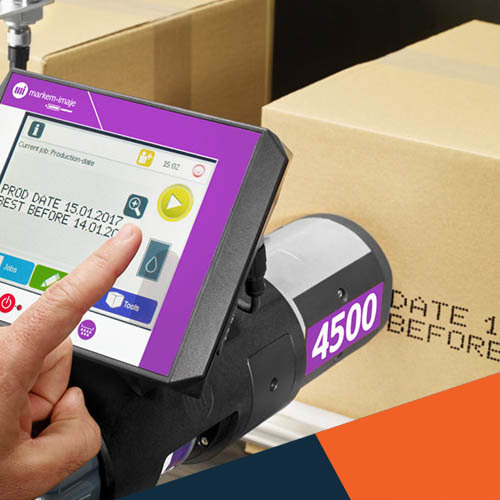 Industry-first pallet labelling via integration between a UR10 Cobot and a Markem-Imaje labeller.